Afshari, M., Bakar, K.,A., Luan, W.,S., Samah, B.A. & Fooi, F.,S. (2009). 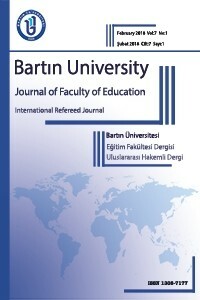 Factors affecting teachers' use of ınformation and communication technology. International Journal of Instruction, 1 (2), 77-104. Arnold, S.R., Padilla, M, J. ve Tunhikorn, B.(2009). The development of pre-service science teacher’s professional knowledge in utilizing ICT to support professional lives. Eurasia Journal of Mathematics, Science&Technology Education, 5(2), 91-101. Atılboz, N. G. (2004). Lise 1. Sınıf öğrencilerinin mitoz ve mayoz bölünme konuları ile ilgili anlama düzeyleri ve kavram yanılgıları. Gazi Üniversitesi Eğitim Fakültesi Dergisi, 24, 3, 147-157. Brown, J. (2011).The impact of student created slowmation on the teaching and learning of primary science. (Yayımlanmamış Yüksek Lisans Tezi). University of Edith Cowan, Australia. Brown, J., Murcia, K. ve Hackling, M. (2013). Slowmation: A multimodal strategy for engaging children with primary science. Teaching Science, 59 (4), 14-20. Darling- Hammond, L. ( 1995). Promising practices in teacher accrediation and standarts. In Marlaine E. Lockheed (Eds). Module training: Decentralization in education. World Bank Resources Sector Professional Week Papers, Washington, DC. Hoban, G. (2005). From claymation to slowmation: A teaching procedure to develop students' science understandings. Teaching Science: Australian Science Teachers Journal, 51(2), 26-30. Hoban, G. (2007). Using slowmation to engage preservice elementary teachers in understanding science content knowledge. Contemporary Issues in Technology and Teacher Education, 7(2), 1-9. Hoban, G.ve Nielsen, W. (2012). Learning science through Creating a ‘Slowmation’: A case study of preservice primary teachers. International Journal of Science Education, 1-28. Hubscher-Younger, T., & Hari Narayanan, N. (2008). Turning the tables: Investigating character-istics and efficacy of student-authored animations and multimedia. In R. Lowe & W. Schnotz (Eds. ),Learning with animation: Research implications for design (pp. 235 – 259). New York, NY:Cambridge University. Keast, S., Cooper, R., Berry, A., Loughran, J. & Hoban, G., 2010, Slowmation as a pedagogical scaffolding for improving science teaching and learning. International Journal of Science and Mathematics 2 (1), 1-15. Kervin, K. (2007), Exploring the use of slow motion animation (slowmation) as a teaching strategy to develop year 4 students' understandings of equivalent fractions. Contemporary Issues in Technology and Teacher Education, 7(2), 100-106. Kidman, G. (2015). Faciliating meta-learning in preservice teachers: using integration and slowmation animation . Procedia - Social and Behavioral Sciences , 167, 117 – 123. Laybourne, K. (1998). The animation book. New York: Three Rivers Press. Merriam, S. B. (2009). Qualitative research and case study applications in education. San Francisco: Jossey-Bass. Miles, M.B & Huberman, A.M. (1994). Qualitative data analysis. Newbury Park, CA: Sage. Ochsner, K.(2010). Lights, camera, action research : the effects of didactic digital movie making on students' twenty-first century learning skills and science content in the middle school classroom. (Yayımlanmamış Doktora Tezi). University of Arizona State, Arizona. Partnership for 21st Century Skills. (2009) Framework for 21st century learning. http://www.p21.org/our-work/p21-framework (Erişim Tarihi: 2013, 12 Ekim). Rakes, G.C., Fields, V.S., & Cox, K.E. (2006). The influence of teachers’ technology use on instructional practices. Journal of Research on Technology in Education, 38(4), 411-426.
knowledge building environment. Journal of Computers in Mathematics and Science Teaching, 21, 253 – 279. Seferoglu, S. S., Akbıyık, C. ve Bulut, M. (2008). İlköğretim öğretmenlerinin ve öğretmen adaylarının bilgisayarların öğrenme/öğretme sürecinde kullanımı ile ilgili görüşleri. Hacettepe Üniversitesi Eğitim Fakültesi Dergisi, 35, 273-283. Songer, N.B. (2007). Digital resources versus cognitive tools: A discussion of learning science with technology, In S. K. Abell& N. G. Lederman (Eds. ), Handbook of Research on Science EducationMahwah, NJ. Lawrence Erlbaum. Wagner, T. (2008b). Rigor redefined. Educational Leadership, 68 (2), 20-24.